Happy Monday! It’s almost Christmas and I am still enjoying all my red and green. But, alas, all things do come to an end. 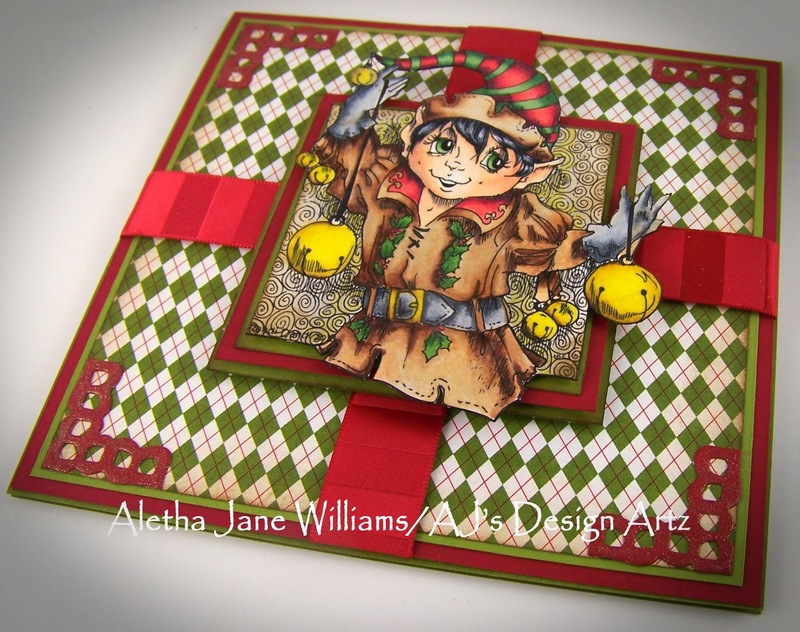 This will probably be my last Christmas card for I Brake for Stamps (IBFS). Now we need to see some spring! That will be next week. 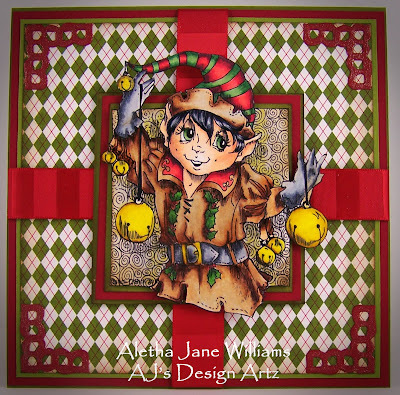 Today I have an art card created with a very handsome little elf. This little character was designed by Rick St. Dennis for IBFS. 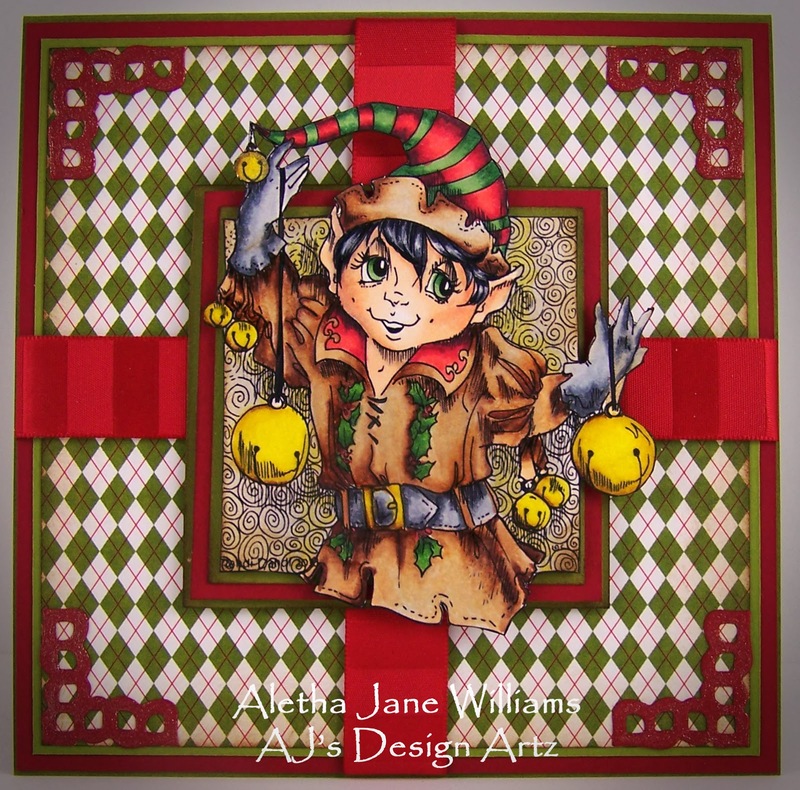 You can find “Jingle Bell Elf” in digital format or as a rubber stamp in the IBFS store, whichever version you like. 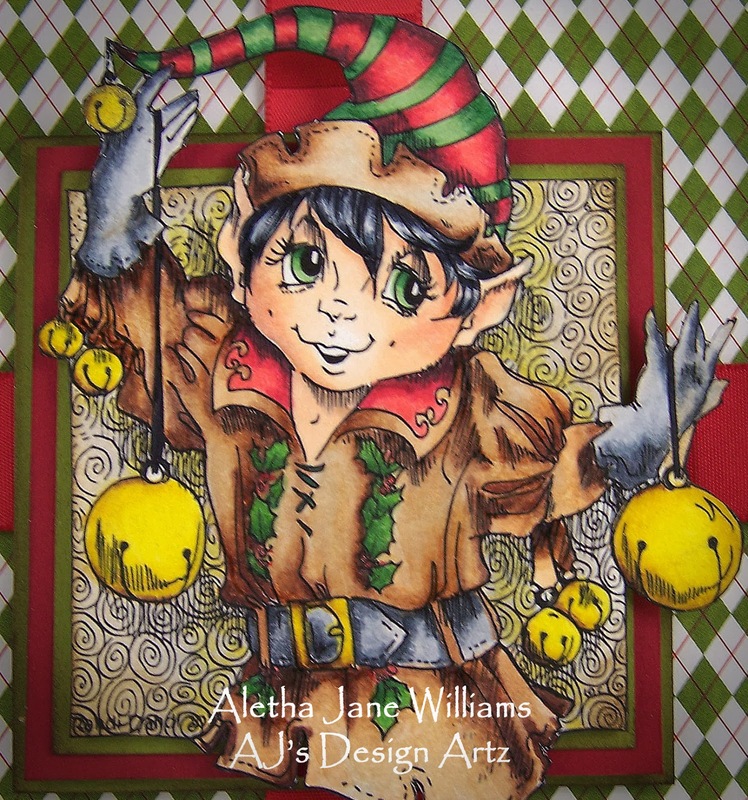 Jingle Bell Elf was color with Copics. I added a light gold Wink of Stella glitter brush marker over the jingle bells. I also added some highlights with green and red Wink of Stella glitter brush markers. Jingle Bell Elf was fussy cut and layered on several layers of Stampin’ Up!’s Old Olive and Cherry Cobbler cardstock. Before I completed all the layering I distressed the edges of each cut piece with Gathered Twigs Distress Ink. My background designer paper is Bazzill’s Countdown to Christmas. I have used this paper stack a lot this season. I trimmed to size and distressed the edges with Gathered Twigs and layered it with Old Olive and Cherry Cobbler cardstock. My corners are from Spellbinder’s Lace Doily Accents. After cutting, and before adding the corners to my card, I added red Wink of Stella glitter brush marker. My ribbon is from my monthly Really Reasonable Ribbon club. Love their ribbons. I hope that you come “like” our IBFS Facebook page. You can keep up with all the sales and new releases. Thanks for stopping by. If you have any questions, please contact me.